An interview with Arnaud Stengel of Erithaj. 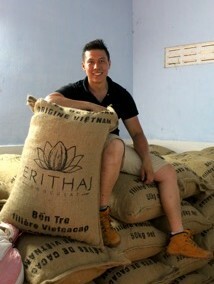 A next generation chocolate maker doing thrilling things with Vietnamese cacao. In Paris, at the Salon du Chocolat last autumn, I had the good fortune to meet two exceptionally exciting young chocolate makers. Arnaud Stengel, founder of the brand new Erithaj, and Franck Morin, scion of the Morin family, and the latest in a long line of that family to head up the historic Chocolaterie Morin. The two men are close friends, are working together (Erithaj collaborate with Chocolaterie Morin in their chocolate making process), and together form a thrilling duo on the chocolate scene, full of potential, both in their collaboration, and separately. Both men, and their chocolates, are more than worthy of your attention. I will bring you interviews with both. 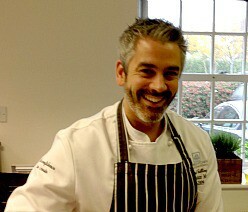 Here starting with Arnaud Stengel. 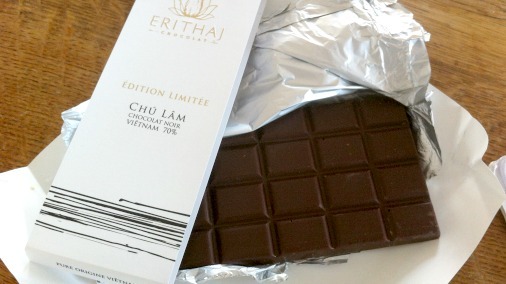 Erithaj, Arnaud’s creation, is a chocolate maker focused on bringing to life and celebrating the very best in Vietnamese cacao. Glorious beans in the Vietnamese sun. Arnaud’s father Stengel senior is on the right of this picture. Your background is multiracial, and that is now influencing your chocolate in terms of your culinary culture, and that of the cacao you use. I would love to hear more about that. My multicultural background influences me in my everyday life. I don’t think I have a special attachment to any country. I consider myself a citizen of the world, a mix of different cultures. In that sense, my approach to the making of chocolate is very open and my perception of taste is very diverse. I like to create new things and mix a lot of different parameters. I consider the making of cacao and chocolate a culture in itself. It is something that you have to feel and experience, as a way of life, or some sort of vibration. I really like to follow my inspiration and am not afraid to change the process along the way. I consider myself an artisan, and in fine food, the product should truly reflects the artisan’s spirit. By tasting a product you should be able to understand the feeling of its creator. Otherwise we are just talking about standardized products which cater mainly to the mass market. You have a collaborative partnership with Chocolaterie Morin. Tell me how that came about and how it works for you? 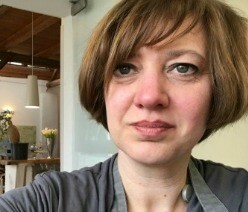 Our collaborative partnership with Chocolaterie Morin was very spontaneous and kind of funny. 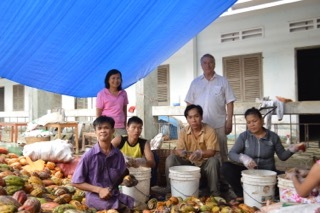 6 years ago, my father had started the fermentation of the very first batch of Vietnamese cacao (about 500kg). He looked for a chocolate maker who could process this batch and found Jean-François Morin (Franck Morin’s father). They had really good chemistry and worked well together. Now this partnership has passed from father to son on both sides. I consider Franck Morin much more a friend than my supplier. We continuously exchange ideas and try to work hand in hand to boost the development of our business. And the most important thing is that we share the same values. For me, it is all about feeling. I am not very methodical and even less a person with a scientist approach. For me, designing my own chocolate could be compared to a human collaboration. You have to treat your chocolate as a living matter with a unique spirit true to its origin and structure. Making chocolate is a great labour of love, it must have been a steep learning curve for you. What have been some of your greatest discoveries? 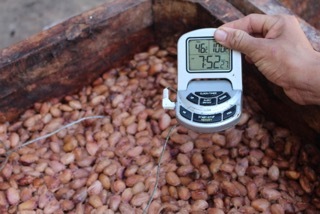 I have learned and discovered a lot about the cacao fermentation and drying process. You can literally feel the product coming to life. It’s like you are raising your own child (although I have never raised a child before). I have also experienced how hard it could be to make chocolate, especially from cacao. Besides the process, I have also learned a great deal about myself and others. For me, the key in making good chocolate and cacao is to have an “open-mind”. 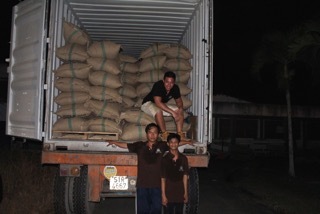 Arnaud in a truck full of his precious cacao. 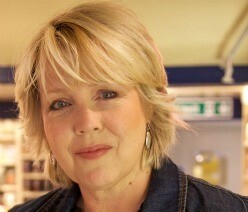 Consumers and food professionals are trying to learn more about the products they are using or consuming. 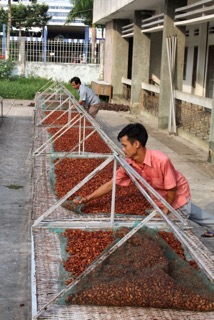 They want to get involved in the whole process and pay much more attention to the origin of the raw materials. I think the chocolate market is actually going through a big change, especially with the emergence of the “bean-to-bar vogue”. This is a good thing, because it forces the traditional chocolate makers to rethink their way, and it also shows people that making chocolate is not easy even if you could afford the best machineries. Making chocolate is about passion, devotion, and usually a matter of “savoir-faire” passed down from generations. Have you always been interested in food? Yes, I have always been interested in eating! They never stop changing and evolving. I am now able to use my palate and feelings for chocolate tasting as well as for wine and tea tasting. The palate and feelings are strongly connected to our mind and memory. 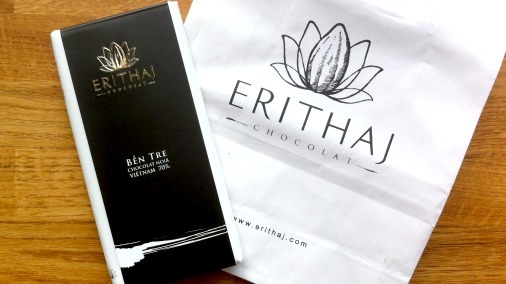 What is coming next for Erithaj chocolate? What plans do you have for the chocolate and for your business? I would like to open a small store in Strasbourg and help people discover how big the world of cacao and chocolate is. I don’t want to be just another chocolatier in Strasbourg. I would like to create something new where people could appreciate my own multicultural background and experience how deep and exciting is the world of cacao. 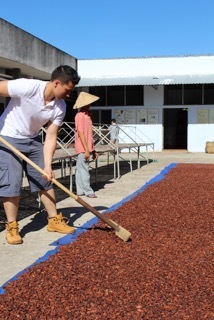 The beautiful red earth colour if this fine cacao. I just like to enjoy a chocolate fondant made with just chocolate, eggs and butter, no flour in it. But what of the chocolate itself. In order to bring home just how special Erithaj is I wanted to write a little of the beautiful results of Arnaud’s labour. 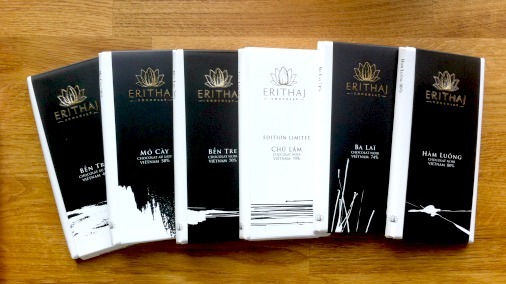 These six bars represent a stunningly delicious insight into Vietnamese cacao and Erithaj’s work with it. Ben Tre 40% milk to start. The Ben Tre 40% milk has a beautiful colour and tempting nutty aroma. It is a treat, almonds, chestnuts and yellow plums are suggested, all unified by a glorious honeyed quality. I found honey to be a very welcome theme in all of Erithaj’s chocolates, not the sticky sweetness of honey, but its gentle earthy aromatic notes. 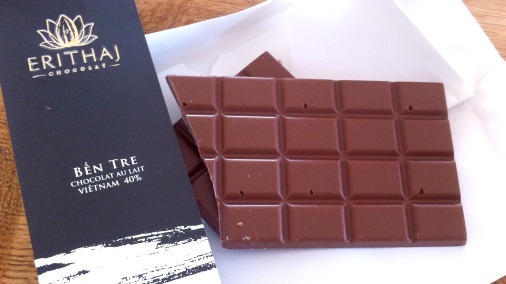 This darker milk, Mo Cay 58% is rich in comforting flavours; gingerbread, dried fruits, fudge. It has a gorgeous malted biscuity taste, a little like speculoos. Lovely. 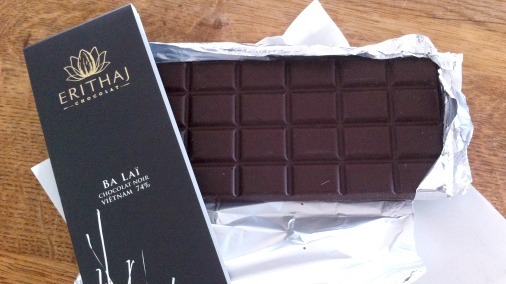 There are many flavour notes in this delightful and easy Chu Lam 70% dark. I found variously cappucino and toast, well infused aromatic tea, slight smoke, caramel and honey at the finish. What was consistent was a very smooth eating experience. 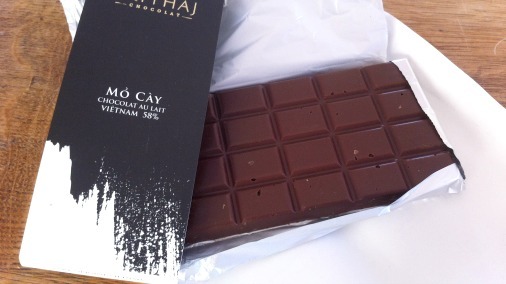 The other 70% dark, another Ben Tre, is up there with the finest chocolates I have eaten. I was utterly charmed by this, loved it, and relished every morsel. I shed a tear when my bar finally came to an end. An enticing honeysuckle smell introduces a bar is full of fruit, citrus, yellow plums and the darker notes of prune. This brightness is accompanied by a sweet and gentle floral quality, elderflower maybe, honey certainly, and a little coffee at the finish. An intense bar, yet with not a drop of bitterness. Moving into darker territory, Ba Lai is again fruity, but introduces spices to the mix, lots of coffee, and a drop of treacle. Very bright and moreish. 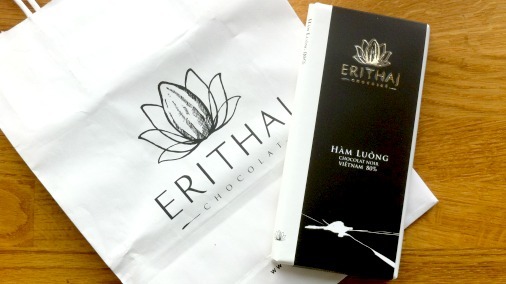 Last but not least, the Ham Luong 80% dark is surprisingly easy for a high percentage bar of complexity. It is dominantly chocolatey, with a great cocoa rich end. But it is also fruity, with blackcurrant to the fore, and spicy too, particularly cinnamon, and a hint of chilli. 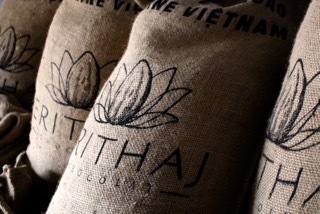 As with all these first class chocolates it is beautifully made, with a fine smooth melt, complex and full flavoured, with a very balanced delivery of the precious qualities of these fine Vietnamese cacao varieties.